Earlier this year, Business in Heels held our first event, starting a movement of professionally focused women's gatherings throughout Bangkok and proving that the City of Angels is much more than just a men’s playground. With a growing number of women coming to Bangkok for jobs and expats relocating for lucrative career opportunities, the city has become a haven of women entrepreneurs, high flying executives and business savvy individuals looking for the next investment. To celebrate the success, ingenuity and creativity that women bring to Bangkok and to end the year in style, we are holding a party, Celebrating 2014 - The Year of Bangkok's Power Women, our final event for the year. The 26th of November will see one of our largest events yet. 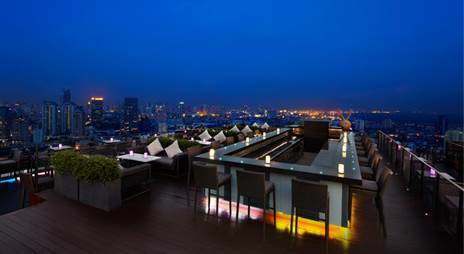 We'll treat you to stunning views atop Anantara Bangkok Sathorn's Zoom Sky Bar and Restaurant. Also join in the fun with our Secret Santa activities to make new connections and meet new people. What is Secret Santa? Secret Santa is where each person brings along a small gift (valued under 500THB) without knowing who they are buying for. You in turn will get a gift from a lady attending the event also. This way everyone will leave the event with a little present, rewarding you for your hard work this year and starting Thanksgiving and Christmas celebrations early. See you at 6.30pm, the first drinks are on us! We anticipate this event to sell out fast due to limited tickets - so we recommend buying yours fast to secure yourself a place! NOTE: this is a women's only event. Tickets will only be available at the door ONLY if the event has not sold out beforehand. Ticket includes gift bag and complimentary welcome drink.